Nigel and I had a couple of days scrambling in the Lake District, with the weather changing from cloudy to sunny at a fantastic pace. One moment with great views and the next in atmospheric clouds. 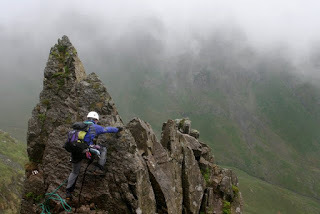 On the second day we ascended Pinicle Ridge - a wonderful grade III scramble hidden away on St Sunday Crag. An extreemly photogenic route, occasionally with wonderful views over towards Helvelyn. We were lucky and met another group with an enthusiastic photographer - thanks for the photos!